From balms and butters to nursing pads and postpartum cloth pads, at Diaper Junction we've got what you need to make self-care as natural and comfortable as possible. Take care of yourself with natural pregnancy and postpartum care products that will provide relief without the use of toxins, plastics and chemicals. Brands like Taylor's Naturals, Bamboobies, Earth Mama Angel Baby and others create quality, natural self care products you can trust. Have a question about our natural product selection? Contact us! 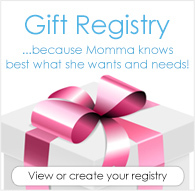 The mama-to-be is often overlooked when it comes to baby shower gift giving. Surprise her with thoughtful, natural products she can put to good use caring for herself while also caring for her newborn.